Assessing the Transferability of Library and Information Science (LIS) Degrees Accredited by the American Library Association (ALA) and the Chartered Institute of Library and Information Professionals (CILIP). Library Student Journal, 2012, Feb.
Ms. Hamlin was kind enough to summarize some of her key points here for us today. I think it’s a fascinating topic. As the world gets smaller, and new grads are encouraged to move in order to find work, it becomes more useful to understand the way degrees are really perceived. Library Student Journal is open-access, so if you want to read more you should be able to click above and get the full text of her in-depth original article. When I was first considering library school, I had my heart set on a program in London. As a lifelong Anglophile this seemed like the perfect choice, and I was excited about what networking opportunities and possible jobs might come about from my attending school in the UK. Knowing that the ALA accredits library schools in the US, I did some research to see if the UK had something similar and came across CILIP, the Chartered Institute of Library and Information Professionals. CILIP’s webpage about overseas qualifications explained that, due to a reciprocal agreement, libraries in the UK recognize ALA-accredited degrees, and that Master’s degrees accredited by CILIP are similarly recognized in the US. I figured I was sorted until a nagging feeling made me check ALA’s website, and sure enough there was no mention of any reciprocal agreement. Instead, ALA just recommends that holders of international LIS degrees have their credentials checked by an independent agency. This discrepancy made me think twice about going to library school overseas, since I didn’t want to risk being considered under-qualified in the US if I couldn’t get a job in the UK. I ended up getting my MLS here in the States, but the quandary of cross-Atlantic credentials stayed in my mind. When it came time to think of a topic for my final research project in library school, I decided to look into how transferable LIS degrees from either side of the Atlantic (including Canada, since the ALA accredits seven programs there) really are. First, I compared the core competencies of librarianship as defined by each accrediting body, as well as the core curricula from all ALA– and CILIP– accredited programs, in order to determine the similarity of the knowledge base expected of LIS graduates in the US, Canada, and the UK. 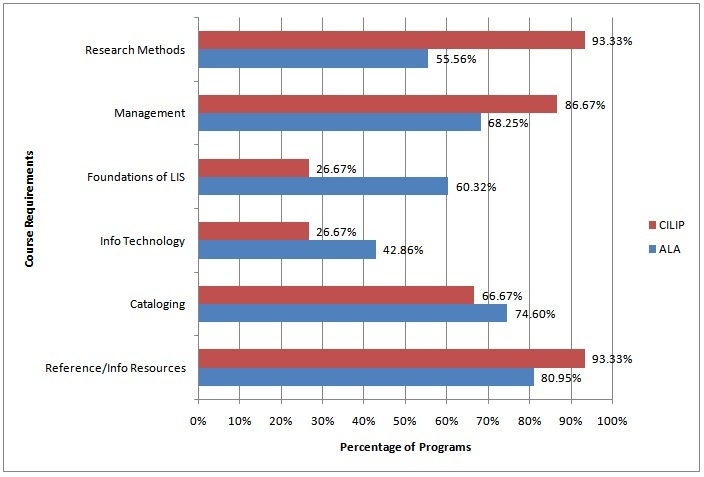 The latter step involved collecting data about required courses or modules from the websites of every accredited (as of August 2011) LIS program listed by ALA and CILIP. Second, I developed and distributed two surveys. One was geared toward LIS graduates of ALA- and CILIP-accredited programs, and the second was intended for library employers in the US, UK, and Canada. Through these surveys I hoped to find out a) a rough percentage of how many LIS graduates were able to successfully use their credentials to gain employment overseas, b) how happy – or unhappy – managers were with any international hires they had made, and c) what, if any, knowledge gaps existed between graduates of ALA-accredited programs and those with CILIP-accredited degrees. A comparison of the core competencies of ALA and CILIP showed that the two organizations hold very similar expectations for graduates of their accredited programs. Though presented in two visually distinct ways and employing slightly different language, ALA’s Core Competencies and CILIP‘s Body of Professional Knowledge (BPK) outlined essentially the same knowledge base that is expected of new members of the profession. The only major difference was that the ALA expects LIS graduates to have knowledge of the history of librarianship; the BPK did not address this topic. Note: In the year-and-a-half since I completed this research project, CILIP has updated their BPK to a new model called the Professional Knowledge and Skills Base (PKSB), which can be viewed here. This new PKSB lays out CILIP’s core competencies in a more direct and specific manner than the BPK did, but apart from a few additions, the competencies appear to be fundamentally the same. 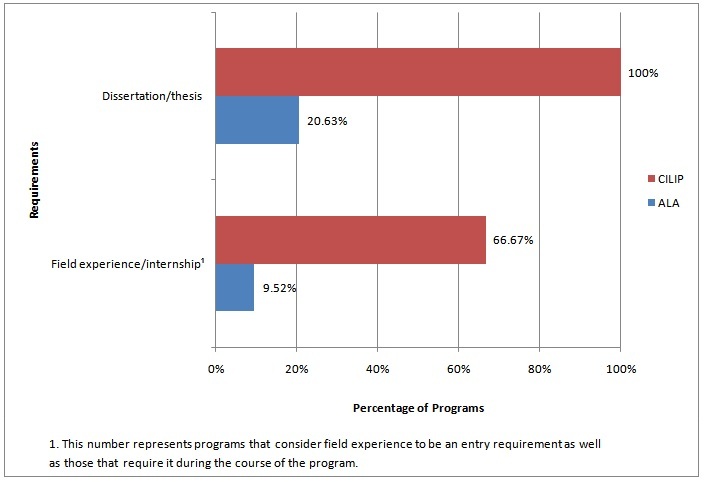 From the data shown in the figure above, it can be presumed that CILIP-accredited programs place significantly greater emphasis on practical experience in the field than programs accredited by the ALA do. In fact, nearly half (46.67%) of CILIP-accredited programs require that applicants have previous related work experience before they can be admitted. Thus it can be argued that graduates of CILIP-accredited programs enter the job market with more hands-on knowledge of the field. However, since the previous work experience of graduates with ALA credentials is unknown and therefore not included in the data, this argument is not thoroughly supported. Another assumption from the data in the figure above is that CILIP-accredited programs are more academically rigorous than those accredited by the ALA, since 100% of Master’s-level programs in the UK require dissertations of 15,000 words or more. It is noteworthy to mention that students in CILIP-accredited programs who do not complete a dissertation still graduate with what is called a Postgraduate Diploma, or PG Dip, and are still considered by CILIP to be professionally qualified. The PG Dip is not recognized by the ALA as equivalent to an ALA-accredited Master’s degree, even though graduates of most ALA-accredited Master’s programs are not required to complete a dissertation and are therefore earning the CILIP equivalent of a PG Dip. From the data gathered in the survey geared toward employers, it can be inferred that employers who hire employees with foreign credentials tend to be satisfied with the speed with which those employees adjust to working overseas, and no major gaps seem to exist in core areas of the professional knowledge base. However, the data from this survey may be biased due to the low number of respondents (13), and unequal representation of employers from varying types of libraries or the countries represented. The data gathered in the second survey geared toward LIS graduates suggests that graduates of ALA-accredited programs are more successful at acquiring jobs overseas in the UK than CILIP-accredited graduates are in the US or Canada; roughly 81% of respondents with ALA credentials who applied for library jobs in the UK reported being successful, compared to approximately 35% of respondents with CILIP credentials who applied for jobs in the US or Canada. However, according to the data, this assumption is not due to the issue of foreign credentialing. While conducting these surveys, I also received some interesting comments via email. Three self-identified American citizens wrote to tell me about how they had earned LIS degrees in the UK, only to return to the US and find that libraries would not hire them due to their CILIP credentials. 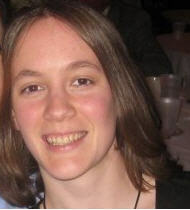 One commented that library administrators told him that “non-ALA degrees would not even be considered, regardless of [the] reciprocity which CILIP currently claims.” Another respondent, who identified herself as a lecturer at one of the CILIP-accredited programs in the UK, shared that a few American graduates of the program had told her that they were denied employment upon returning to the States. In contrast, two respondents with non-CILIP credentials shared that they were able to find professional jobs in the UK without any difficulty. Thus, although not reflected in the statistical survey data, it is clear that foreign credentialing is indeed an issue when it comes to professional LIS employment in the US. I drew three conclusions from this study: 1) ALA and CILIP expect roughly the same of their LIS graduates, since their core competencies are so similar; 2) required courses in both ALA- and CILIP-accredited courses differ, but neither side of the Atlantic shows a greater deficiency in covering the core competencies than the other; and 3) most ALA-accredited Master’s degrees are effectively the equivalent of CILIP-accredited PG Dips, and graduates of CILIP-accredited programs are more likely to have more practical experience in the field. If those conclusions are true, then why has it been so difficult for graduates of CILIP programs to have their credentials recognized in the US and Canada? The ALA claims to celebrate diversity, and “promotes the exchange of professional information, techniques and knowledge, as well as personnel and literature between and among libraries and individuals throughout the world” (American Library Association, 2011b, para. 1). Wouldn’t working alongside library professionals who earned their degrees from around the world be a great way to do just that? Michael Dowling wrote in 2007 that the ALA has changed its policies to be more accommodating of foreign credentials, but that the organization hasn’t communicated this change well enough to human resource departments. However, most of the comments I received about CILIP credentials being denied in the US indicated that this problem has continued since 2007. If the ALA has indeed changed its policies, it doesn’t seem to be communicating them any better. I, for one, would like to see this question of transferability addressed more clearly by the ALA and CILIP, in hopes that more LIS students don’t complete a year or more of study and hard work only to find that their degree is effectively worthless in the country where they’d like to work. Hello, Reading this article is very timely as I consider a Masters in Information science from a UK university. I already hold ALIA credited library qualifications that are transferrable in UK. However, the graduate degree is not transferrable in Pakistan even for a entry level job in Pakista. Very troubling state of affairs. They have based their system on ALA and it is a must to have a Masters degree.